All Dessert Tour – Announcement and Giveaway! What goes better with dessert than a great cup of coffee? We’re proud to announce that we’ve added Cafe Brioso as a mid-point stop on our All Dessert tour – a pleasant pause to refresh the palate and explore some of the finest artisan-roasted brew in the city. 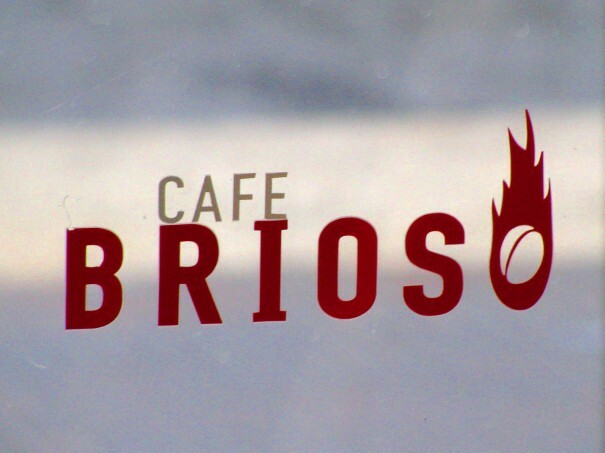 Cafe Brioso focuses on providing high-quality gourmet coffees, loose-leaf teas, and coffee accessories, as well as a made-from-scratch daily menu of sandwiches, soups, salads and baked goods. Their artisan-crafted coffees are roasted in-store by owner/roastmaster Jeff Davis and have a strong following among Columbus coffee geeks. We’re thrilled to have them as a tour partner! To celebrate this addition, we’re giving away a pair tickets for this Saturday’s dessert tour. To enter, tell us your favorite coffee drink in the comments (and make sure you leave your email address so we can contact you should you win). If you are not a coffee drinker you can choose another drink instead. To participate, you should be available for the tour (2.30pm-6pm on Saturday, July 16th). A winner will be picked at random at 10 pm on Wednesday July 13th. I’m not a coffee drinker but I love a good herbal tea. My husband’s favorite coffee is caramel latte. My favorite coffee drink is simply a good quality roasted coffee with a little cream. Perfect in its simplicity. White Chocolate Moca from Starbucks. My favorite coffee drink is all of them, but particularly the cafe cremes I had in Paris this spring. My fallback favorite is a good strong carmal macchiato, but love the maple mocha at Brioso!! Iced coffee. It’s hot out! Hot or cold, at home my favorite is the Crimson Cup Flowing Amazon blend. If I’m out and about, I’ll pick a cafe misto for my hot beverage or an iced coffee/latte from A Touch of Earth @ the North Market – the best cold drink ever because they use Snowville milk! I’m a complete sucker for iced coffee drinks, but my favorite (sadly gone!) was the Espresso Rocket Shake at Insomnia. I miss that all the time! Hazelnut coffee is my fav! I love a smooth ice coffee with a little cream on a hot summer morning! I love some good coffee with just a little bit of soy milk…yum! Black and strong. My mother told me when I started drinking coffee to not be tempted to put anything in it. She knew if I became a coffee drinker I’d drink it all day long. I can’t tell you how many calories I’ve saved by taking her advise. Mom’s always know best! I love a cup of highlander grog from Cup O’ Joe! My favorite coffee is actually McDonald’s regular with cream and splenda! My favorite fancy drink is Chai Tea!!! As for gourmet coffee the best I had was in the Bahamas..but any Fairtrade with flavored cream will do! My favorite drink is at Cafe Brioso! I love their honey vanilla latte! My favorite coffee drink is a Caramel Mocha! A wonderful cup of delicious, freshly ground, good quality beans regular coffee- black. Just hits the spot every time. Anything Ethiopian from Brioso. JJ and crew are the best in the state. I love a good iced latte. Tim Horton’s extra large coffee with cream. Coffee. Strong and black. Nothing else required when getting from awesome Cafe Brioso! Ca phe sua da, or Vietnamese iced coffee with milk is my favorite coffee drink. First of all, so much sweetened condensed milk! But I also love the wait, the process, and having time to appreciate the simple details. I love the beautiful little metal filter that sits over a tiny glass, and watching the coffee drip drip drip into the milk pooled at the bottom. It’s sort of an exquisite torture, but when it is finally time to stir everything up and pour it over a cup of ice – so good!! A rich, strong espresso with one sugar in the raw. Pure deliciousness! I’m a new coffee drinker…and my favorite way is with a little choc milk, a splash of half-and-half, and some ice. My favorite drink, by far, is iced tea…black tea…sweetened with Splenda or unsweet…tons of ice. I call it “nectar of the gods” and am a complete addict. I crave the vanilla lattes hand crafted at Cafe del Mundo!! The Cafe Cubano at Brioso is delicious!